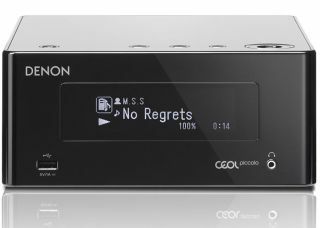 Denon cuts the price of its CEOL Piccolo and RCD-N9 music systems | What Hi-Fi? We gave the original Denon CEOL Piccolo five stars in 2013, now there's a new version which is £70 cheaper. There was an awful lot to like about the original Denon CEOL Piccolo music system, which impressed us back in 2013 with its neat design, good sound and extensive connectivity. It was replaced about nine months ago by the £299 Piccolo DRA-N4 system. The latter is enhanced with the addition of Spotify Connect - the original model had Spotify built in, but you had to go through a laborious log-in process to access it. It also gets Bluetooth and NFC (Near Field Communication) for direct streaming from Bluetooth-enabled devices. Denon says the design of the unit has also been updated with a double-layer acrylic top and new buttons on the fascia. The icing on the cake is that the new model has also had a £70 price cut, so costs £230 without speakers. The rest of the spec is as before, so you get 2 x 40W (into 4ohms), DLNA and AirPlay compatibility, gapless playback of audio files up to 24-bit/192kHz, a front USB socket, wi-fi support and a digital optical input. Denon's optional SC-N4 stereo speakers cost £69/pair, but you can use the Piccolo with other speakers if you wish. At the same time, Denon has cut the price of the bigger CEOL RCD-N9 system from £399 to £329 . (without speakers). The optional SC-N9 speakers cost £99/pair.